Echeverias are one of the most popular and stylish succulents on the market today. The rosette form of echeverias add a unique aesthetic to low-maintenance gardens. In warm climates, echeverias can be planted outdoors in flower beds with well amended soil. You can highlight their beautiful foliage form by planting them en masse. But, plants are equally appealing used as individual specimens. While echeveria are primarily grown for their foliage, plants do flower towards the end of summer. In cooler regions echeverias are typically planted in containers in order to protect from frost. Native to Central America and Mexico, echeverias actually prefer a bit more water than you might expect for a succulent. They prefer deep waterings with periods of drought in between. While it’s easy to overwater succulents, it’s just as easy to underwater them when frequency or volume is not adequate to keep plants hydrated. Another misconception is that echeverias and similar succulents prefer full sun all day. While this works in cooler climates, full sun in very hot climates can actually scorch echeverias. Afternoon shade or dappled shade in the afternoon is advised when planting echeveria in a hot climate. 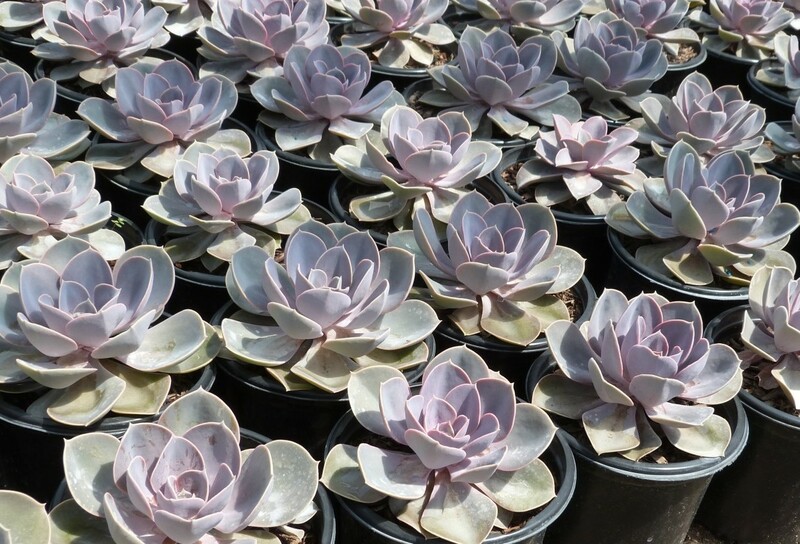 Two of our favorite varieties include: ‘Black Prince’, known for it’s deep purple/black leaves and nice flat rosette; and ‘Perle von Nurnberg’, which sports grey leaves that have a powdery look with pink undertones.